From New York Times bestselling author and Founding Fathers' biographer Harlow Giles Unger comes the astonishing biography of the man whose pen set America ablaze, inspiring its revolution, and whose ideas about reason and religion continue to try men's souls. Thomas Paine's words were like no others in history: they leaped off the page, inspiring readers to change their lives, their governments, their kings, and even their gods. In an age when spoken and written words were the only forms of communication, Paine's aroused men to action like no one else. The most widely read political writer of his generation, he proved to be more than a century ahead of his time, conceiving and demanding unheard-of social reforms that are now integral elements of modern republican societies. Among them were government subsidies for the poor, universal housing and education, pre- and post-natal care for women, and universal social security. An Englishman who emigrated to the American colonies, he formed close friendships with Benjamin Franklin, Thomas Jefferson, and James Madison, and his ideas helped shape the Declaration of Independence and the Bill of Rights. However, the world turned against Paine in his later years. While his earlier works, Common Sense and Rights of Man, attacked the political and social status quo here on earth, The Age of Reason attacked the status quo of the hereafter. Former friends shunned him, and the man America had hailed as the muse of the American Revolution died alone and forgotten. Packed with action and intrigue, soldiers and spies, politics and perfidy, Unger's Thomas Paine is a much-needed new look at a defining figure. 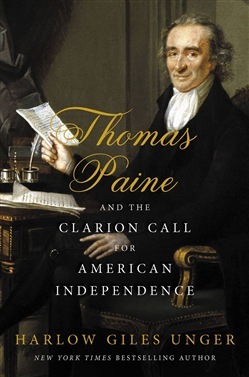 Acquista Thomas Paine and the Clarion Call for American Independence in Epub: dopo aver letto l’ebook Thomas Paine and the Clarion Call for American Independence di Harlow Giles Unger ti invitiamo a lasciarci una Recensione qui sotto: sarà utile agli utenti che non abbiano ancora letto questo libro e che vogliano avere delle opinioni altrui. L’opinione su di un libro è molto soggettiva e per questo leggere eventuali recensioni negative non ci dovrà frenare dall’acquisto, anzi dovrà spingerci ad acquistare il libro in fretta per poter dire la nostra ed eventualmente smentire quanto commentato da altri, contribuendo ad arricchire più possibile i commenti e dare sempre più spunti di confronto al pubblico online.